Fill reservoir with filtered or distilled water. If using tap water, add a few drops of Exo Terra Aquatize to help neutralize and detoxify the tap water to make it safe for reptiles and amphibians (follow dosing instructions on Exo Terra Aquatize packaging). Replace and tighten spray top. Do not over-tighten. Pump to build up the pressure in the reservoir. Do a small test spray first to find the ideal pump pressure. Do not over pump. To spray, press the first button on the handle. Do not aim toward or spray directly at the reptile. For continuous spraying, press the second button on the handle. Turn the nozzle on the spray head to adjust spray width as necessary. 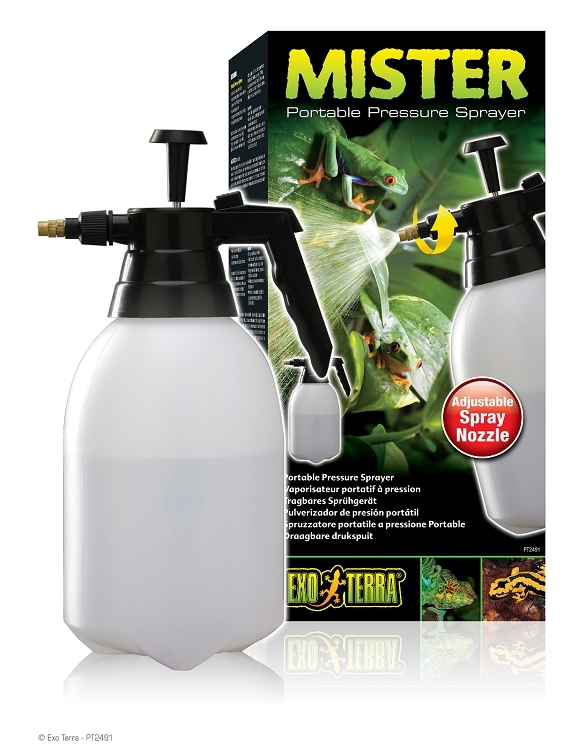 Refill with fresh water each time the Exo Terra Mister is used (on daily basis). Empty reservoir before storing.